So everybody knows the record "Beat Bop," or at least they should. It's most famous, I suppose, for having a picture cover painted by the famous artist Jean-Michel Basquiat. But it would have a place in hip-hop history even without it. It's known as being one of - if not the - first alternative hip-hop records. I mean, people will disagree because how do you define strict parameters for "alternative," but it's a very old school (1983), funky hip-hop jam with some far out, "experimental" sounds. Discordant sounds and "random," instrumentation, extreme echo sporadically applied to the vocals. It's by an O.G. graf writer, MC and breaker famous for his appearance in Wild Style, Rammellzee. 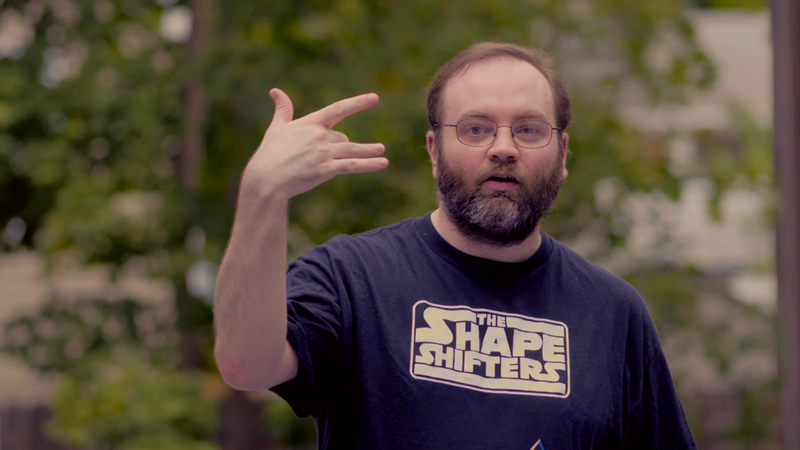 He used to create these crazy Voltron-looking costumes and repped an art movement called gothic futurism. So he was one half, and the other was this young kid (at the time), K-Rob. 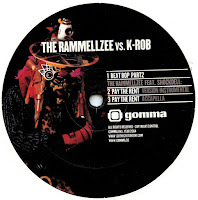 The record's actually credited to Rammellzee Vs. K-Rob because it's ostensibly a battle, but it's not a battle in the sense you think of today, where they're dissing each other and rhyming snaps. They're just constantly passing the mic back and forth, trying to show each other up, either with their skills or their weird deliveries, and it's all set to one of hip-hop's funkiest basslines of all time. 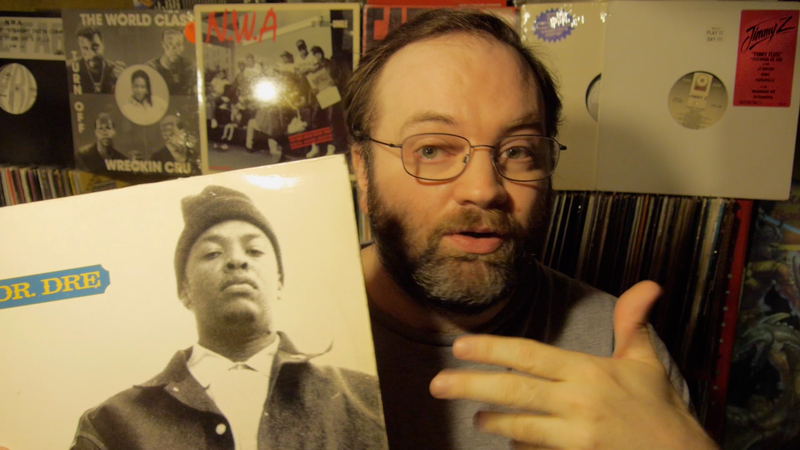 It's also possibly the most repressed hip-hop record of all time. But that's part 1. Far less well known is this 2004 follow-up. 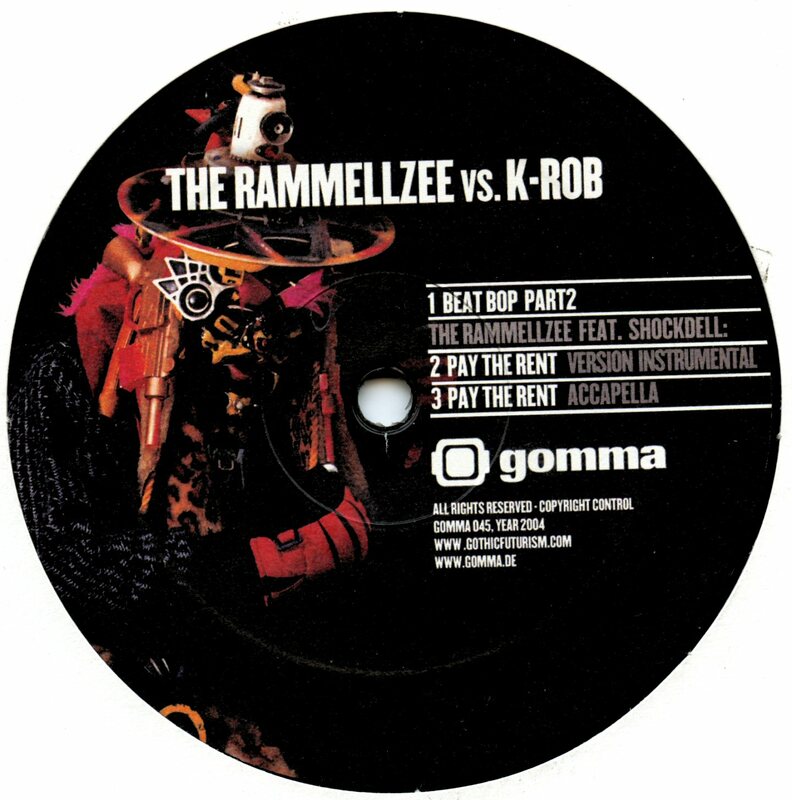 It's a 12" single, as you can see above; but it's taken from Rammellzee's second album, Bi-Conicals Of the Rammellzee with Shockdell. If you don't know Shock, Ram and Shock did records together all the time, dating back to the Wild Style soundtrack. But fortunately they didn't just replace K-Rob with Shock, they brought K-Rob back for this song. ...Not that K-Rob had totally disappeared between "Beat Bop 1" and "2." He stuck with Profile Records to put out a couple singles in the mid 80s. "The Day K-Rob Came Back" is pretty hot. But he did fall out of the public eye later in the 80s, so it was a pleasant surprise to see Ram bring him back in 2004. Anyway, "Beat Bop 2" and the Bi-Conicals album were on Gomma Records, which is a German label. There never was a US release, so don't feel bad if you slept on it; but by 2004 we were all on the internet, so I doubt I'm blowing anybody's minds talking about this. But I'd say it definitely qualifies as slept on. And it's actually pretty good. I mean, when I first heard of it, I was definitely be prepared for it to be self-indulgent and terrible. And the album as a whole is probably a little self indulgent. But the single's cool. It's produced by some guy named Jaws, and it does a nice job of harking back to the feel of the original without using the same bassline or otherwise just rehashing it. There's some hot samples, the beat changes up, and yeah they do go right back into the same style of short verses and occasional funny voices. I kinda wish they would've tried to match the length of the original (4 minutes vs 10), but what we've got is all good. Honestly, if you dig the original, you should dig this one. I'd be more cautious recommending the whole album - I think it's probably only for the serious fans. But the single? Yeah, they sound pretty old school for 2004, but it all works as part of its appeal. Definitely check it out. It's also got a B-side, "Pay the Rent," which is also produced by Jaws with additional rhymes by Shock and a cool electro throwback vibe. 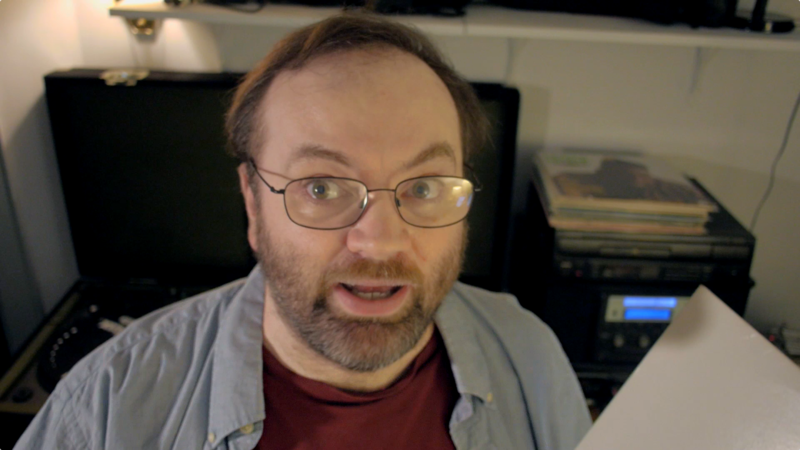 It's not a song I imagine people giving regular rotation; but it's got a strong concept and a great hook, which is just some guy yelling at Ram to pay his rent and abusing him. "Pay the Rent" has all the extras: instrumental, acapella, etc. But I'm sure "Beat Bop Part 2" is the one everybody copped this for. If you're in an old school mood, or were just dreading being let down by this, I say give it a shot. It's actually a worthy sequel. Werner's Epic: There It is! Congratulations! You've passed The Werner Challenge! In the mid 80s, when Melle Mel and Grandmaster Flash were splitting The Furious Five and everything was up in the air, Scorpio put out a couple solo 12"s: "Black Shades," his Air Jordans song and this weird collaborative 12" with a new wave rock band called Mondo Boffo. I vaguely remember this song from back in '86 (I was awfully young), but I didn't realize it was an actual record, as opposed to a recruitment commercial. It's simply called "Marine," and yeah it's about wanting to join the marines. The band sing the "I wanna me a marine!" chorus and play all the instruments, while Scorpio provides all the substantive lyrics by way of his rap verses. If you're a fan of 80s nostalgia, hoo boy, will this be right up your alley. It's damn catchy and kind of a weird hodge-podge of period styles. Electric guitars, funky percussion, old school rap and a chorus that songs like it could be an alternate theme song for the GI Joe cartoon. I can naturally see a lot of heads avoiding this - I was pretty wary myself - because it's a cheesy rock band rather than a proper hip-hop production. And I certainly wouldn't stand it up against the classic breakbeats. But for 86, it's as good as a lot of stuff MCs were rhyming over. These are at least talented musicians. 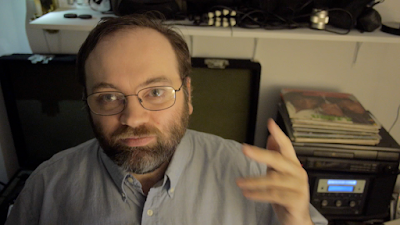 About the situation, and about my job. And helpin' out the brothers in Lebanon. I wanna show the world that I am the man!" When you're swinging from a tree, shootin' off your gun. You're just another dead American! Our boys sign up to fight and die. I have to live my life before I die!" It's kind of a good expression of the duality of everyone who considers joining up for the military, whether they do or don't. Sometimes he seems to be clearly warning listeners away, but other parts of the song seem like fun moments left in intentionally for marine audiences, like when the chorus joking switches out to "I wanna use the latrine!" for one bar. Indeed, any of the sentiment that suggests maybe it's not the ideal lifestyle seems like it's best appreciated by actual marines. Here's a little more history that only serves to confuse things further. This song comes from the soundtrack to an 80s Italian (but shot in Florida) horror film written by the controversial Umberto Lenzi called Primal Rage. 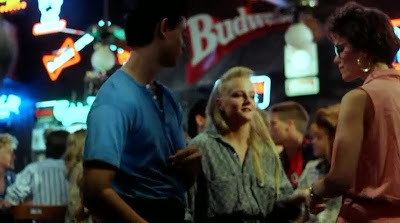 It's featured pretty prominently, for a good couple minutes, in the bar scene where a double date turns into violence when the reporter who's been infected by a chemically altered baboon's blood crushes a fellow student's wrist. Is there an intentional use of irony in this scene of inappropriate, bubbling violence in the youth of the film and the content of the song? Or did the producer just like how it sounded for their student characters to dance to? As you can see, this 12" comes in a colorful picture cover. It's an image from the song's music video, where the abstract graffiti is animated and created on-screen. There's a B-side version, called the Rock version (the A-side is specifically labelled the Rap one), without Scorpio. Instead, one of the rock guys half sings/ half raps Scorpio's verses. Obviously, he's not nearly as good, but the instrumental is entirely different, too, with some unique horns, totally different guitar tracks and even different drums. There's even a hint of kazoo, which ties it in to some other Furious Five cuts. It sounds like an entirely distinct, separate song, actually, until you realize all the lyrics are the same. So it's at least interesting. The whole record is at least interesting. I'm not saying you should replace your copies of "Eric B Is President" or "Spoonin Rap" with it. It's obviously a pop rock song with rapping more than a proper hip-hop song; and to modern audiences, I'm sure it's especially corny. But it's still worth checking out, and maybe throwing it into your crates for cheap. This is the kind of record you stumble across and have to buy ...assuming it's super cheap, of course. This is the one and only single by 9-7-6 (for you youngsters, a reference to 976 numbers that, like 1-900 numbers, were premium pay phone numbers you could call for adult chats). And what's so "must buy" about it? 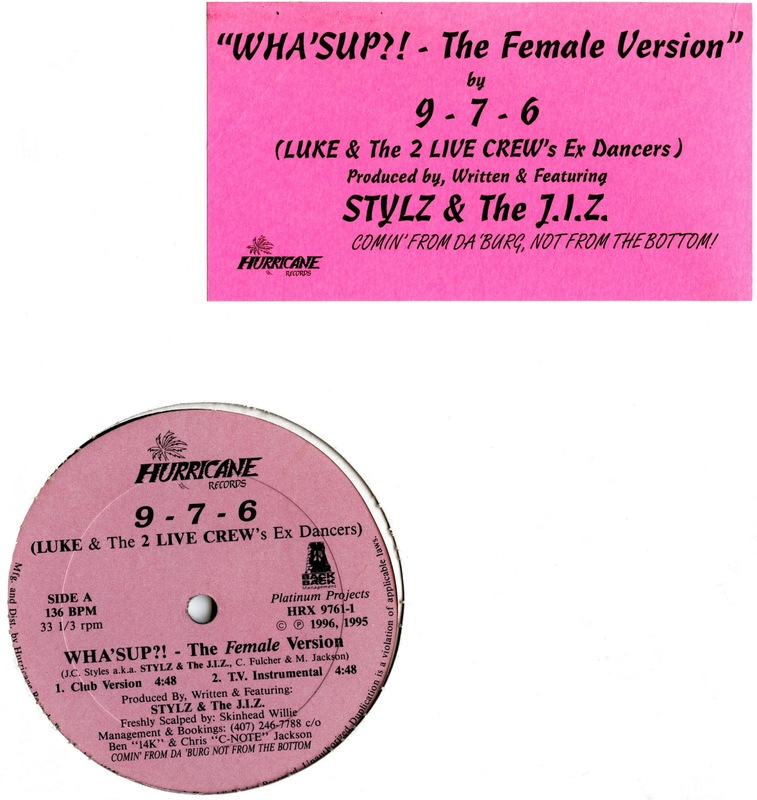 Because it says right on the sticker there, 9-7-6 are Luke & The 2 Live Crew's ex dancers. In 1996, they released their own 12" on Hurricane Records. The song's called "Wha'sup?! - The Female Version." You'd probably expect it to be a diss at Luke and/ or the Crew, but nope. Disappointingly, they never even mention them. So what's this song a "female version" of? A little trend that was going on down South at the time. In 1995, Atlanta's Diamond & D-Roc had a bit of a dance hit with "The Bankhead Bounce" (Bankhead is actually a city in Atlanta). Even if you're not into Southern rap stuff, you've probably heard of the dance, if not the actual record that spawned it. Well, a bit part of that song is a "what's up, what's up?" chorus. And shortly after that started blowing up, a group called The A-Town Players released a song called "Wassup Wassup" with basically the same chorus (including the "do the Bankhead bounce" part) a very similar instrumental. 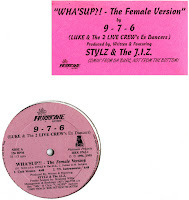 Then Playa Poncho and LA Sno released "Whatz Up, Whatz Up," and I don't think I need to tell you what that song was like. So by 1996, 9-7-6 were a little late to the party. But that's what their song is, another "Wha'sup." It's produced by Stylz and the J.I.Z., a name you may not be familiar with, but Stylz is one of many of many aliases of Jan C Styles or Marvelous JC, a big time bass producer who'd been making records since the 80s. He may've even owned Hurricane Records. They also guest rap on here. So this one's kinda fun. JC's a good producer, so it's one of the better Bankhead bounce rip-off's, with a lot of "Planet Rock" mixed into this version. This is definitely more of a Florida-style version than all those Atlanta versions. They don't even mention the Bankhead bounce dance; they've just latched onto the "what's up, what's up" part. Unfortunately, they're kind of boring as MCs. They not only neglect to mention their 2 Live origins, they don't say much of anything. They mention they're "sipping on cognac" in both verses and spend half the song just listing cities they want their record to play in. Honestly, Stylz and J.I.Z. probably should've made this record on their own and created another song for 9-7-6 to cash in on the "former dancers" angle. They never made another record, so we don't really learn anything about 9-7-6. Their name implies a sexual edge, but they never go there on this song. It's not even clear how many of them there are (guessing: three?) or what their names are. The label mentions they're "comin' from da burg not from the bottom," so we know they're from St. Petersburg, Florida, not Miami. That's about it. Oh well, kind of a missed opportunity, but not a bad Bankhead bounce record if you're in the mood for dancing like it's the mid 90s again. It's been a while, I think it's time we come back to another one of those subtle, but slightly improved Marley Marl 12" remixes. You know, not the kind of thing where a song's given a whole new instrumental, but just where all the same elements are tweaked and arranged slightly differently, and wind up making the version on the 12" single sound just a little iller than the album version. This was becoming a regular Marley M.O. with examples like "Ain't No Half Steppin'," "Arrest the President" and "Juice Crew Law." 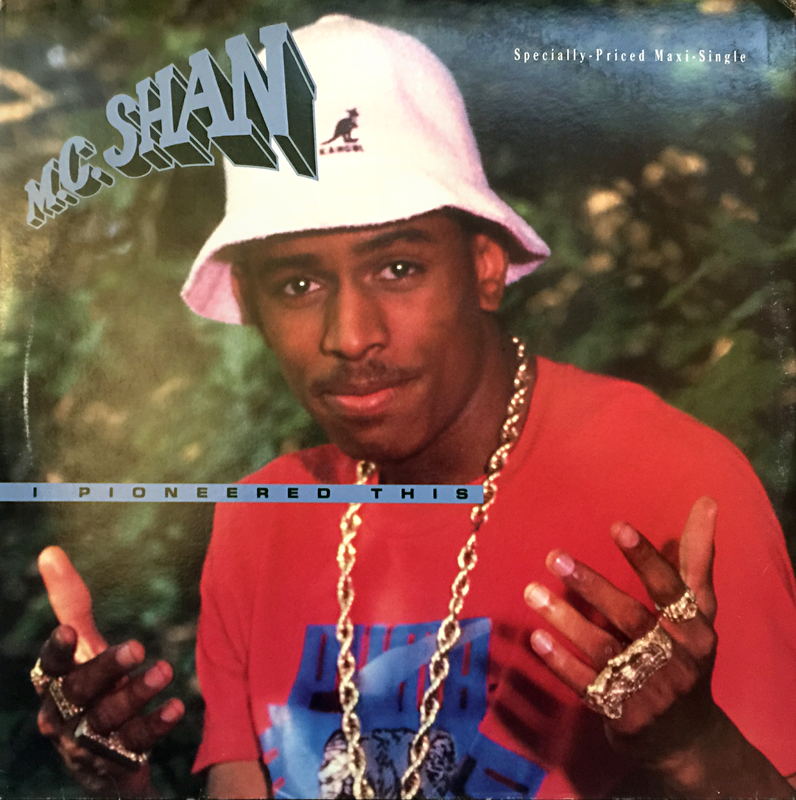 This is MC Shan's "I Pioneered This" from 1988. Like "Juice Crew Law," this is another single off Shan's second album, Born To Be Wild. But unlike "Juice Crew Law," this isn't a case where you have a main, commercial single without a remix, and then a second, promo version with it. In this case the remix is right there on the main, picture covered 12" single. It starts off with the regular Vocal version, which is the same as what's on the album. And there's a Dub and A Cappella mix on the B-side. But the stand-out track on this single is the one marked Hip Hop Vocal. Now, the vocals are the same on both versions... I guess they just mean to say this is the vocal version of the Hip-Hop Mix. And even the beat is kinda the same. A casual listener who didn't hear both versions back to back might not even realize he'd heard to different versions of the same song. But when you pay attention, the differences might be subtle, but they're still substantial. One of the reasons it can be hard to catch, too, is that on the original version, the beat isn't constantly doing the same thing. It's not one simple loop repeated from the beginning to the end of the song, it's shifting and going through variations. So at any point when you're listening to the remix, it's easy to think "oh, I'm just not listening to that part of the song right now." But the remix is definitely different. I'd describe it as more "broken down," more fucked with than the original, which often lets the bassline repeat a full refrain. Here, we never hear more than half at best, it's more choppy. Like a lot of these remixes, it's like Marley just went back in and played with it some more, making it more original and "hip-hop sounding." Hence the name of the mix, I suppose. I could see a lot of fans, especially more mainstream audiences, actually preferring the original because it stays truer to the original sample, sounding a little more "musical." The remix also changes, well, the mix (i.e. the traditional definition of a remix), so the drums and horn stabs are a little harsher, adding to the harder feel of this remix, which is a definite plus in my book. "I Pioneered This" is a pretty cool song either way, though. It's kind of the sweet spot between Shan's more awkward, younger records (the extreme example being "Feed the World") and his more out-there, genre switching stuff when he stopped working with Marley. This is MC Shan in full Juice Crew soldier mode, that ideal end of the 80s era. It's pretty 80s lyrically, too, with him declaring, "Puma's the brand cause the klan makes Troops" and "I transform just like a Decepti-gone." Yeah, that spelling's right, that's how he pronounces it. I don't think he was being clever, there; I think he just wasn't that into Transformers. ha ha Plus, he says "write a will for your family's conveniency. Rappers I serve without mercy or leniency," which is one of my favorite contrived hip-hop rhymes of all time. Conveniency! But seriously, Shan sounds great over a hard but smooth Marley Marl production. The main sample is the same one Big Daddy Kane would later use for his killer remix of "Uncut Pure." It's great, especially the Hip Hop Mix. 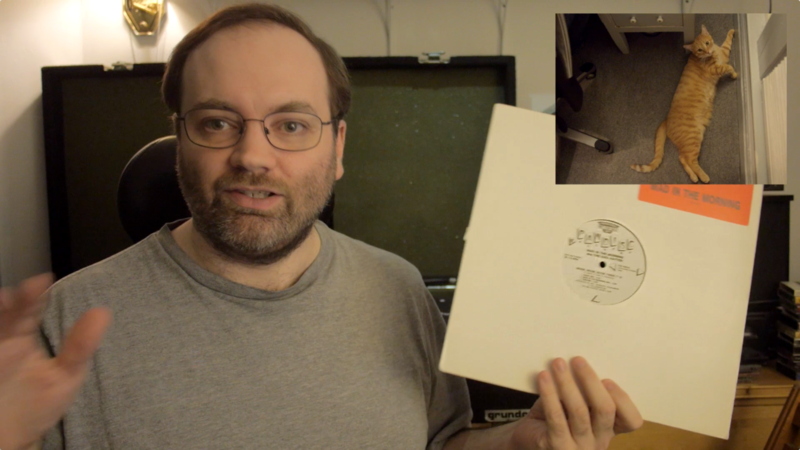 And because it's right there on the main, commercial 12", it's not rare or expensive to get a copy, like some of those others are. Crate staple.